David Price was born on Monday, August 26, 1985, in Murfreesboro, Tennessee. Price was 23 years old when he broke into the big leagues on September 14, 2008, with the Tampa Bay Rays. His biographical data, year-by-year hitting stats, fielding stats, pitching stats (where applicable), career totals, uniform numbers, salary data and miscellaneous items-of-interest are presented by Baseball Almanac on this comprehensive David Price baseball stats page. 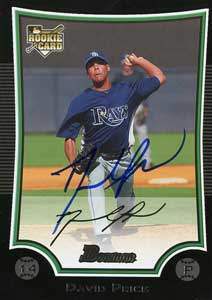 On September 30, 2012 , David Price recorded his twentieth victory of the year, making him the first 20-win pitcher in Tampa Bay Rays ERA Champion in Rays history as well. For his efforts, Price was awarded a Cy Young Award , the first Rays ' pitcher to receive the honor!